Partner retires after more than 30 years with law firm – but won’t be going far just yet! After more than 30 years with the Firm, Nick Williams retired from the Partnership of Porter Dodson at the end of April. 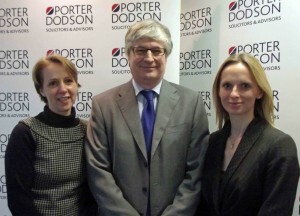 Nick will remain with Porter Dodson for a further year, continuing to work alongside Partners Sharon Collier and Kate James in the highly regarded Private Client team. The team is one of only four in the area to be recognised for its work in leading legal directory, Chambers UK. Nick began his legal career with Porter Dodson as a trainee, qualifying as a Solicitor in 1981 and becoming Partner in 1986. He is an active member of the local community and has established an impressive client base in and around the towns of Wellington and Taunton. Through his professional reputation and contacts he was invited to sit on the Receiver’s Panel of the Court of Protection and was appointed Chair of the Taunton and West Somerset branch of the Alzheimer’s Society. Nick is President of The Rotary Club of Wellington District and spearheaded their recent charity book shop initiative which raised over £4,000.